native plants. Visit any one of these seven wonders and we guarantee you will fall in love. decomposed granite crunches underfoot as you walk past aloes and potted prickly pears that are silhouetted against the compound’s whitewashed, bougainvillea-topped walls. From $199; . 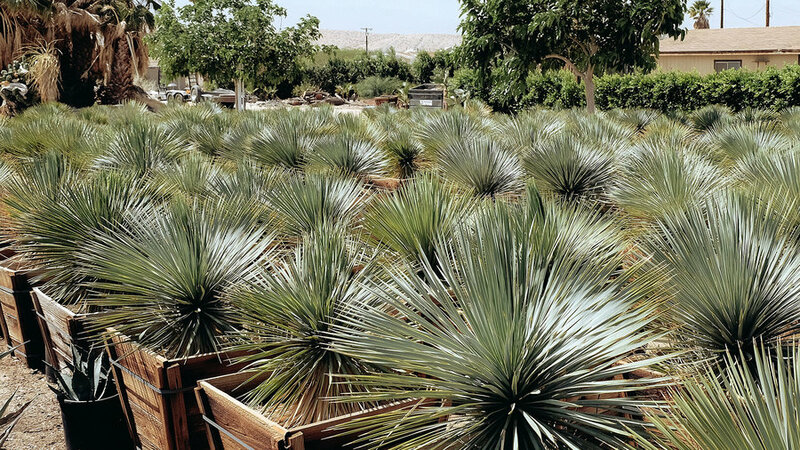 The Indian Canyons, a stone’s throw from downtown Palm Springs, are the region’s famous spot to see California’s only native palm, Washingtonia filifera, in its natural habitat. But we prefer to palm-watch at Thousand Palms Oasis in Coachella Valley Preserve, about 15 miles outside of town. 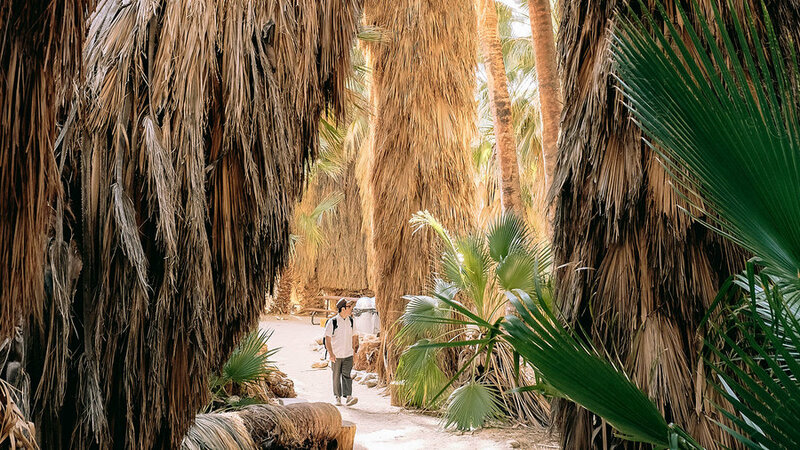 Stop first at the Palm House, the 1930s home of naturalist Paul Wilhelm, and get directions for the 1-mile hike that leads across a swath of desert sands straight out of Star Wars or Lawrence of Arabia. Its ending point is McCallum Grove—no mere marsh but an actual lake surrounded by dense, lush stands of the native palms. Walk the boardwalk perimeter and get lost looking up at the intricate palm canopies. Unlike manicured garden specimens, these trees stand tall with their grass skirts of dried fronds, testaments to decades of palm preservation. Donation suggested; . For most of the journey to this Desert Hot Springs nursery, you’ll be cursing the people (that would be us) who told you about it. You drive down desolate Dillon Road, whose undulations make you feel you’re riding a roller coaster, and begin to worry that you’re nowhere but in the middle of meth country. Then, at last, you spot it—a field of blue-green spiky orbs growing in 24-inch wooden tree boxes—and give thanks to the heavens. “We’ll sell anything to anybody,” co-owner Luis Huerta assures, and that’s what’s remarkable about Sunland: They will indeed sell you cactus in sizes and quantities usually reserved for wholesale nurseries. Hop into Huerta’s golf cart for a tour and you pass sweeps of field-grown golden barrel cactus and rows of containerized palms, agave, and euphorbia, all of them seemingly waiting to be moved from the nursery to your front yard. 7–4 Mon–Sat; 28900 Pushawalla St., Desert Hot Springs; (760) 347-5598.
to become a shining example of sustainable landscape design. 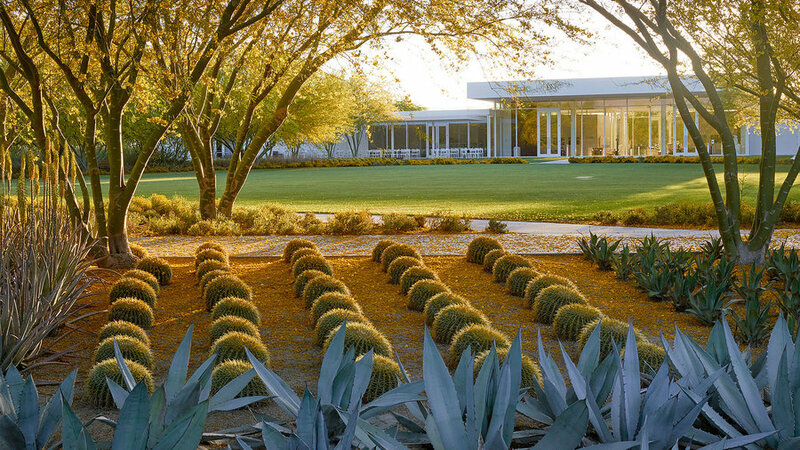 When the center expanded a few years ago, drought-mandated water restrictions prevented a continuation of the green, lawn-heavy landscape beloved by Leonore Annenberg. Instead, landscape architect James Burnett drew inspiration from the Annenbergs’ large collection of Impressionist and Post-Impressionist paintings (Cézannes and van Goghs among them) to create a 9-acre canvas where plants are used almost as paint. Cactus, for example, that are usually shown off alone are massed together, creating lushness not common in the desert. You’ll want to take your time exploring—each step reveals a slightly different, hypnotizing vantage point. And luckily there’s barely a step you can take without being protected by the shaded canopy of a desert tree. Time your visit for late winter, when canary yellow flowers from palo verde trees fall on spiny barrel cactuses like yellow snowflakes. Free admission, guided tours $40; 37977 Bob Hope Dr., Rancho Mirage; . With its iconic 23-foot bris de soleil—that’s French for a shade-producing decorative wall—rising at the entrance, the Parker Palm Springs hotel is high style right from the start. That’s one reason it draws celebrity guests like Brad and Angelina and Robert Downey Jr. But you’re here for the Judy Kameon–designed grounds, viewable by hotel guests and by diners at Norma’s, one of the Parker’s restaurants. Don’t expect one breathtaking view—Kameon designed her landscapes to be explored nook by nook, courtyard by courtyard. Taking her cues from as far away as Spain’s Alhambra and as nearby as Montecito’s Lotusland, Kameon crafted a series of hidden gathering spaces, connected by walkways, enclosed with plants. 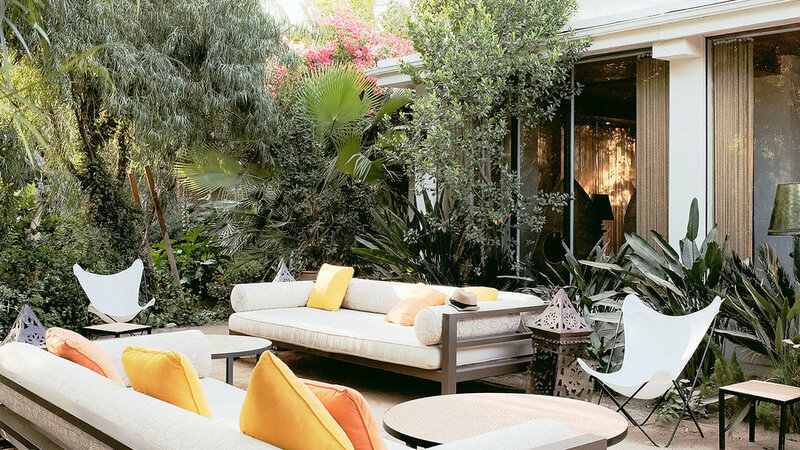 Her palette is entirely Mediterranean; palms, olives, and limes are among her staples. And if you can’t decide which direction to turn next, just follow your nose. Kameon has planted intensely aromatic plants almost everywhere, so that you can be guided by the scents of sage, citrus blossoms, and sweet jasmine. Rooms from $395, Norma’s $$; . This private resort community was Walt Disney’s own desert Magic Kingdom. The animation king bought a house here in 1948—then had to sell it to raise money to build Disneyland. When his Anaheim, California, amusement park became successful, Disney returned to build an even larger house at Smoke Tree. Visit today and you’ll understand why Walt, or anyone, might fall for this rustic resort. 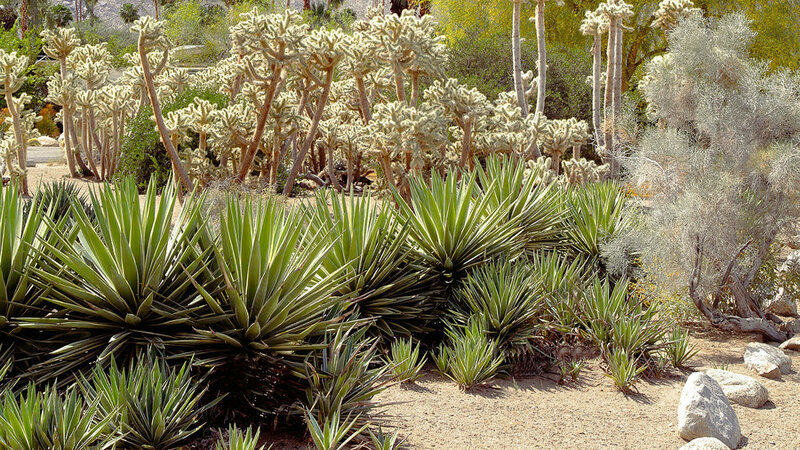 The centerpiece is the specimen garden: Sonoran and Colorado Desert plants arranged shortest to tallest, creating a jaw-dropping festival of spines with the San Jacinto Mountains as backdrop. Smoke Tree was also forward-thinking in terms of wise water use in the desert, banning front lawns in the 1920s. This is, however, one of the trickiest desert gardens to experience: Unless you own a home here, the only way to visit is to stay in one of the guest cottages, and these book up years in advance. If you’re one of the lucky guests, be sure to hit the specimen garden at dusk when the cholla spines glow like auras. From $400; . 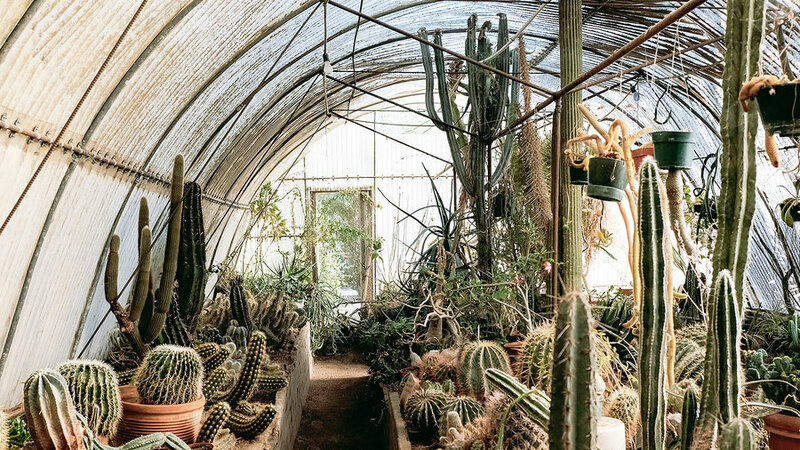 seriously—kitschy knickknacks mingle with the plants, and a sign directs you to the “World’s First Cactarium”—a made-up term for the greenhouse. As for Clark Moorten, he pretends to be as bristly as his cactus collection but is ready to talk plants to anyone who will listen. One good story: That sideways-growing palm is the result of a lightning strike in the 1950s. $5; closed Wed; 1701 S. Palm Canyon Dr., Palm Springs; .